After a week and a half of being completely overwhelmed at work, Chris and I drove down for a couple days of fun and relaxation with his family on the Jersey shore. The June-long rain ended with the month and the weather was perfect for morning cereal on the deck, strolling the boardwalk, and lazing with a book on the beach. 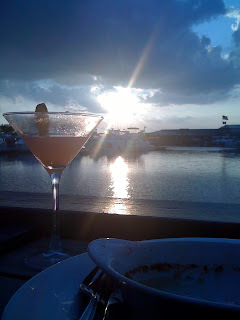 During our trip, we had meals ranging from barely edible to decent; a couple tasty appetizers and cocktails at sunset on the last night were a memorable reprieve. But after only two days away, I missed my kitchen terribly. We drove home in the early afternoon, watching the southbound traffic build, thankful that we’d be spending the holiday at home. We weren’t concerned about seeking out fireworks this Fourth (though we did catch a glimpse of sparkles and smoke from behind the Empire State Building). Besides, the pink, paint-like streaks of clouds as the sun was setting filled us with all the oohs and ahhs we needed for the evening. We relaxed into home, loving the feel of our couches, the familiarity of each detail, watching contentedly as our pup–exhausted from several days and nights at doggy camp–collapsed into a quiet pile of soft white fur wherever she stood. I positioned myself in my familiar place in the kitchen and began chopping vegetables and tearing herbs. It wasn’t long before our apartment was filled with the haze of sweet, delicious smoke wafting from the grill pan. Few foods taste of summer to me the way that sweet corn does. Growing up, this was the only time we ate it. We’d have never even thought to buy those frozen, plastic-wrapped cobs from the grocery store, and I can’t remember once opening a can or freezer package of kernels. “Knee high by the Fourth of July” was the saying. We’d all watch, driving by the fields through the spring and summer months, as the stalks reached higher and higher, eventually sprouting tufts of golden silk amid their long, tongue-like leaves. At the height of the season, green farmer’s carts appeared on corners throughout town, spilling with sweet-smelling ears. Sometimes you’d also find cantaloupe, peaches, and tomatoes so plump and sweet that the only way you could imagine eating them was sliced with a light sprinkle of salt. But you couldn’t not stop for the sweet corn. We’d buy a dozen or two at a time, counted into paper grocery saks and eagerly driven home. My brother and I would sit on the back stoop and tear the husks and sticky hairs from each yellow and white marbled cob. My dad then boiled them up in a large pot on the stove, a scoop of sugar thrown in to enhance their sweetness. When it came time to eat, we’d take a fresh, new stick of butter and roll the entire cob along it lengthwise, creating a corn-shaped dent down its middle, and then salt it generously. This was the corn of my childhood, and man was it good. Our corn this Fourth, however, was grilled with an agave lime butter. We both had to agree that this is our new favorite way to eat this summery treat. In a small bowl combine the softened butter, agave, lime zest, and a pinch of salt. Carefully peel back the husk of the corn, leaving it attached at the base, and remove the silk. Spread the butter mixture evenly over the kernels and fold the leaves back up around the corn. Place on the grill and cook for 15-20 minutes, turning every 5 minutes. If you’d like to have a little bit of that smoky char, peel back a section of the husk and place the exposed corn directly on the grill for an additional 5 minutes. Pull the husk away from the corn, spread any remaining lime butter on top and sprinkle lightly with salt. Serve. We ate this sweet, citrus infused corn alongside lime marinated chicken breasts topped with a spicy chimichurri. Contrast this with your favorite spicy or smoky summer dish. We may have skipped the more traditional backyard barbecues and main street parades, and relaxed inside instead of camping out for a prime firework-viewing spot, but tonight felt like the Fourth. In fact, it just might have been my favorite yet.